Stocking stuffers can be somewhat of an afterthought. After all, most people spend their time shopping for what goes under the tree-not what hangs on the mantle. But instead of letting stockings fall by the wayside, we have some great DIY ideas for you to whip up cheaply and quickly at home for the men, women, and children in your life. After a long holiday, it's nice to relax! 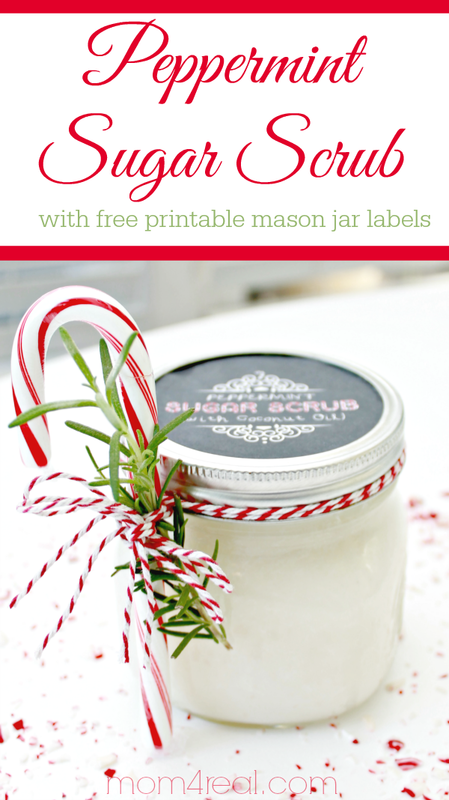 Give your special girls this homemade peppermint sugar scrub so they can take a load off. We love how this crafter wrapped the peppermint scrub up with rosemary and a candy cane, but if you're shoving it in a stocking, you better leave it out, or it'll get crushed. This recipe doesn't call for candy canes per se, but this is a fantastic way to use up extra candy canes and give a special lady in your life a thoughtful stocking stuffer. You can follow the recipe in the tutorial above, and then smash candy canes up into a fine grit in a plastic bag. Sprinkle them in for color and fragrance. This DIY cinnamon spice candle is the perfect complement to a DIY spa stocking stuffer theme. 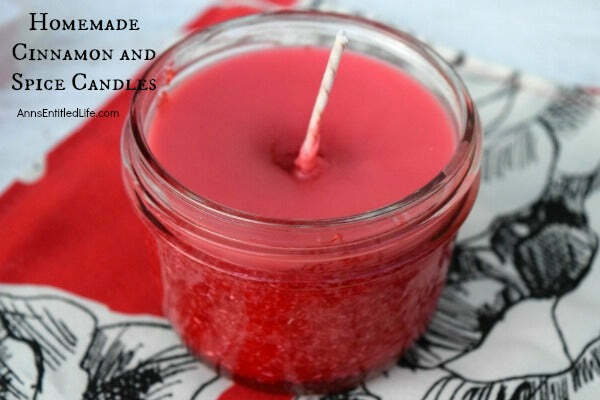 Candle-making goes back hundreds and hundreds of years, so trust us when we say this is a simple craft to do at home. Just make sure you choose a pretty jar to put this candle in-and one that can withstand heat. Top it all off with a holiday label you created by hand, and you'll have one thoughtful stocking stuffer the women in your life will love. Give her what she really wants this holiday: wine. This Santa's Flask is absolutely hilarious and would be a funny gag to pull on Christmas morning. 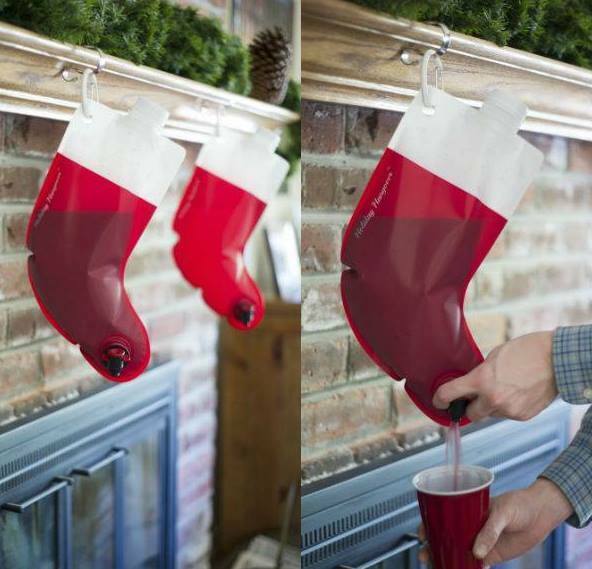 Let your wife or girlfriend go to bed, then hang this flask stocking up in place of the fabric stocking. Place it by the mistletoe and you're sure to get a big kiss! Another way to enjoy this stocking is by wrapping it up inside of a classic stocking and including a bottle of wine. If you make the candle and peppermint scrub we featured here too, then you'll be one of the best stocking stuffers around. Leave the wine to the adults, and the reindeer root beer to the kiddos! We think this is an adorable idea and it's easy to do in under an hour. If you have lots of kids, give them one bottle each. Just make sure to pad it with softer items, so the glass doesn't break into a sticky mess! You can shop online or go to the local craft store to get red pom poms, googly eyes, and pipe cleaners. Then, bring home your favorite root beer or cola and get to work. This is gross, but it's something kids will giggle about for days! 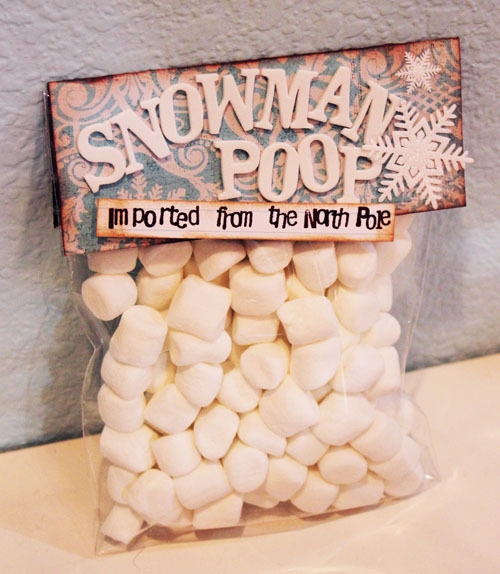 You can make your very own if you buy mini marshmallows and create a custom label. You could also adapt this idea to include reindeer poop if you use chocolate candies instead of marshmallows. If this is too gross for your family, try one of the other three ideas on this list! You can find giant plastic candy canes at pretty much every drug store around Christmas time. 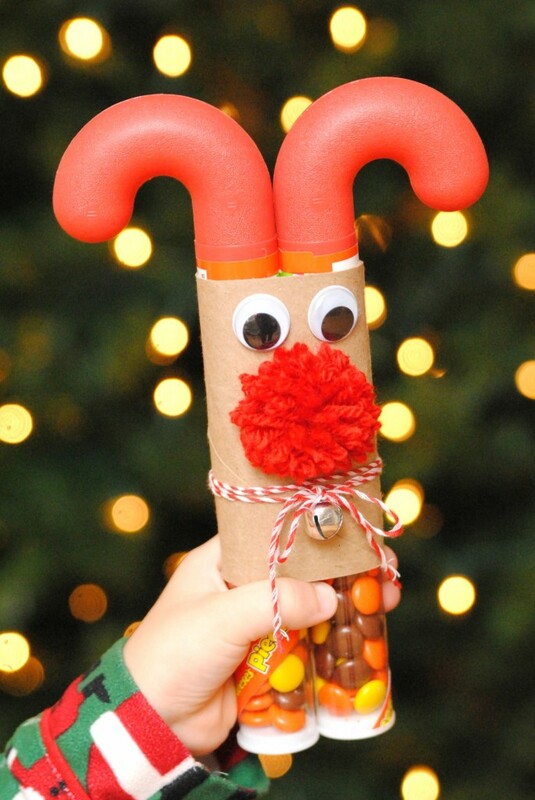 Stock up on some (or use tubes from last year), and then give them a unique look with this reindeer design. This reindeer candy stocking stuffer requires a big pom pom for the nose. If you can't find one at the store, learn how to make one at home with red yarn. Then, all you'll need is large googly eyes, brown construction paper, some twine, and a bell to finish this look. 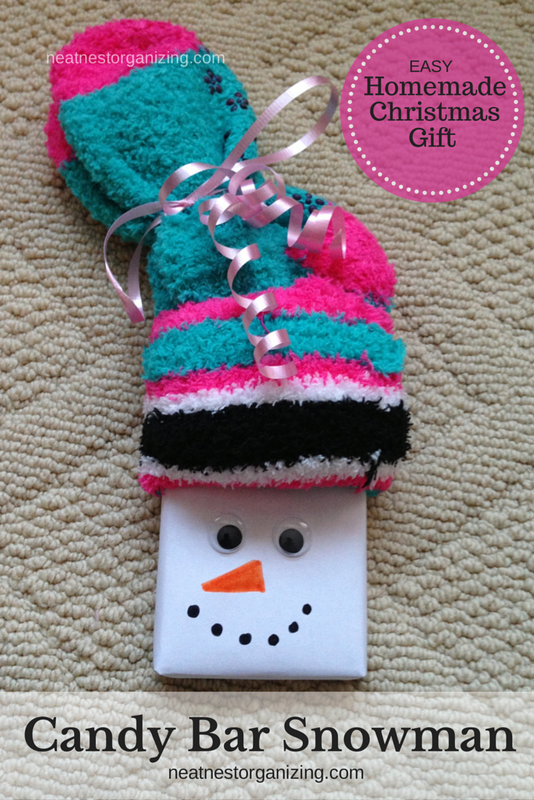 This awesome stocking stuffer combines two treats into one: fuzzy socks and a yummy candy bar. You can shop for warm and comfy socks at your local dollar store and king size candy bars from CandyDirect.com! If you know how to wrap a present, you'll be able to make these snowman candy bars at home. Just use white wrapping paper and then draw a snowman's face with markers or paint. The google eyes are a nice touch, but you can just as easily draw or paint them on to avoid shopping for one more thing. Tell the men in your life how much you love them this Christmas with chapstick. "Merry Kissmas" is such a cute saying and plays up the holidays in a fun way. 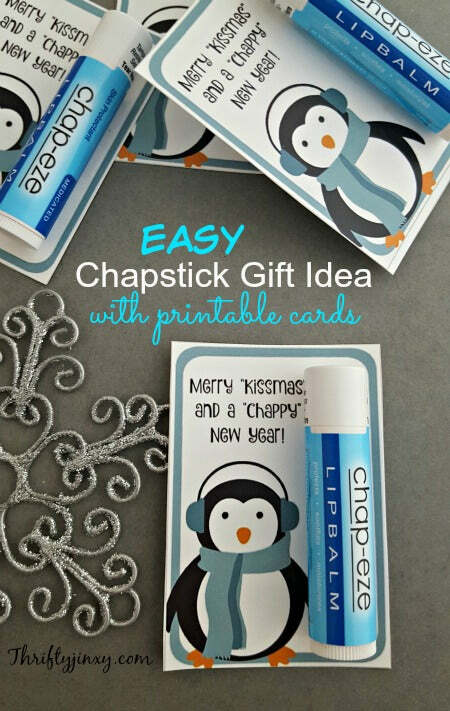 Bring home your favorite chap stick and print the cards in this tutorial below to get the look. If you want to really go above and beyond, you can make your own chapstick for a cheap stocking stuffer. Ingredients usually include beeswax, oil of some sort, and essential oil, so making chapstick yourself is a great way to save money and customize flavors and ingredients! Make sure your special guys have warm fingers and toes all winter-long with these hand warmer stocking stuffers! If you have leftover fabric scraps, this is a fantastic way to use up supplies and save lots of money. The plaid print here is masculine, but you could swap it out for a red plaid to make it more Christmas-y too! 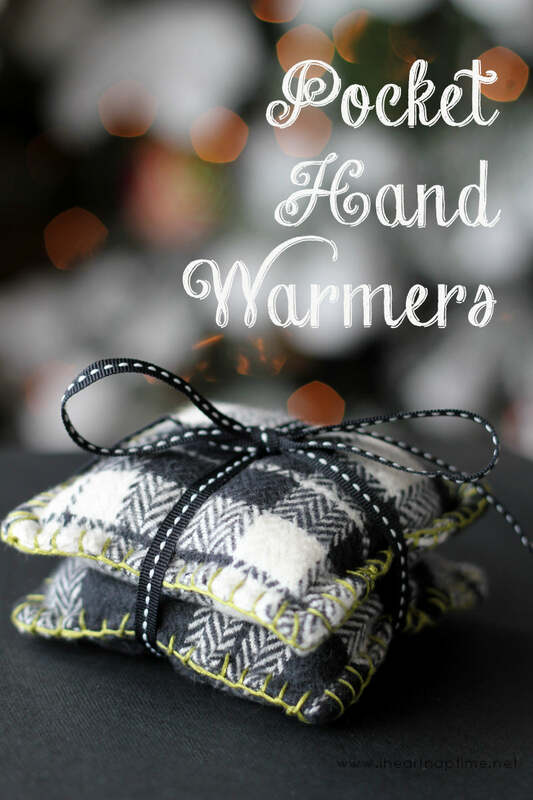 Make these even more amazing by including dried cloves and cinnamon sticks inside so when you heat them up, these hand warmers smell as good as they look. Sometimes, it's easier to let people buy what they want! But sometimes it feels impersonal to give someone a card with money in it. This is your solution: origa-money! The star shape makes it suitable for Christmas, and the dollar amount you fold up is up to you! Just know that no matter which stocking stuffer you make on this list, the recipients will love them and so will your wallet.